We’ve already spent a good chunk of these summer days out camping somewhere in the Cascades. Mount Hood, the Metolius River, the McKenzie River and two different Clear Lakes. 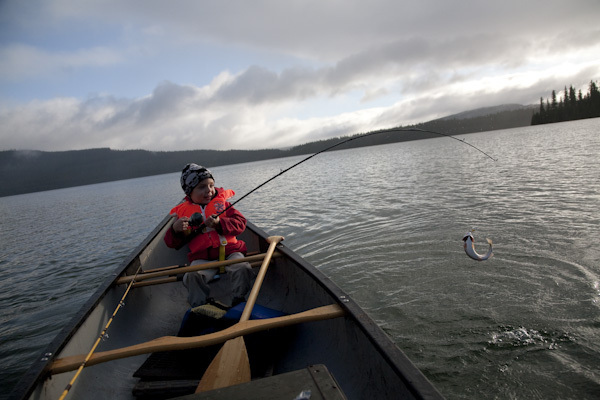 The driving force and unexpected thrill of all of this has been watching Leo, 4, dive into fishing with the patience and hope of a man twenty times his age. You can’t warn a child what it will feel like when a fish is on the line. We’d gone out paddling and fishing before, but came home empty handed. So while he was interested and patient, I’m not sure the hope was there before that rainy morning he reeled in his first fish. The thrill and energy of having a fish on the line hadn’t yet been inscribed in his memory. So now we go where he can zing a few casts with his favorite lure “Lucky.” Each time he hooks a fish, it will be exciting. But for me, nothing will compare to that June morning up on the side of Mount Hood, under a sky full of clouds and rainbows. 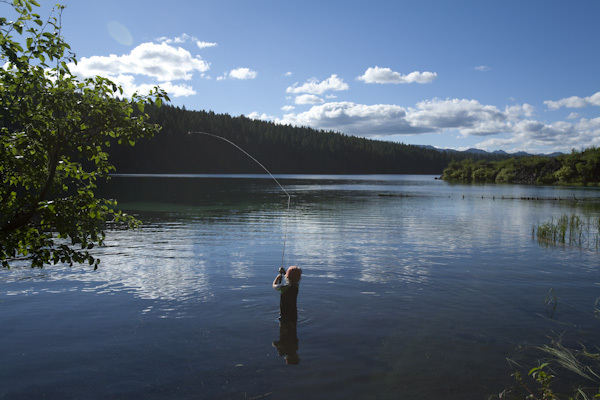 On Clear Lake, headwaters to the McKenzie River, embodying the well know quote from Miguel de Cervantes: There’s no taking trout with dry breeches. This entry was posted on Wednesday, July 14th, 2010 at 3:10 pm. It is filed under Explore, family, the northwest, travel and tagged with fishing, labarge, lake, oregon, photography, photojournalist, portland, tim, timothy, trout. You can follow any responses to this entry through the RSS 2.0 feed.